I realize it's been a while since we talked dessert. It's been even longer since I've given you a recipe involving chocolate. Both facts are surprising since there's hardly ever a day that I don't have at least a bite of chocolate or a nibble of something sweet after dinner. In fact, for my birthday dessert this last weekend, I chose the only chocolate dessert on the menu at The Saltry in Halibut Cove. Zucchini are big and abundant this time of year, and Alaskans are always looking for new ways to use them, so I offer you a pan of rich, gooey zucchini brownies. 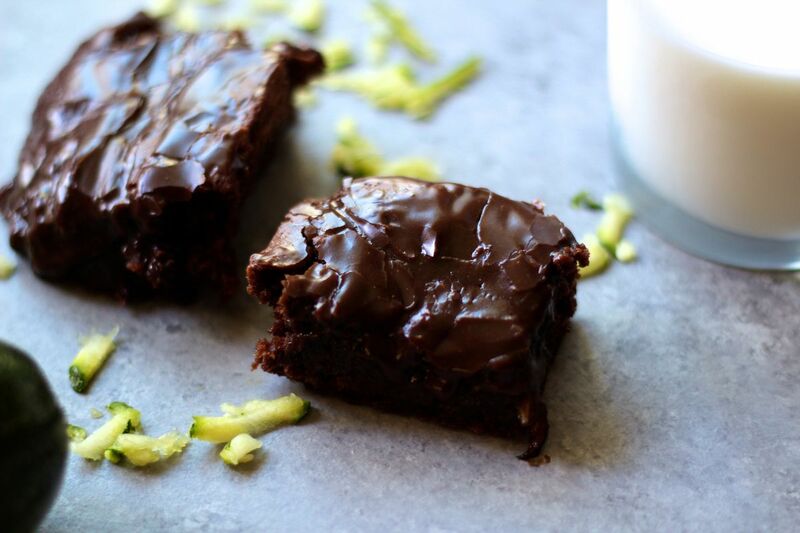 Zucchini naturally hold water, which releases as it bakes, giving the brownies that fudgy texture that many say is essential to a good brownie. You top these brownies with a quick saucepan chocolate frosting, similar to the kind used on Texas sheet cake. Fair warning: you may need to eat these with a fork. Preheat oven to 350 degrees. Line a 9-inch by 9-inch baking pan with aluminum foil, then spray the foil with non-stick baking spray. Set aside. To a saucepan over medium-low heat, add the oil, morsels and cocoa powder. Whisk together until melted and smooth. Remove the pan from the heat and whisk in the sugar, followed by the egg, egg yolk and vanilla until combined. Stir in the grated zucchini. Fold in the flour, baking soda and salt until everything is just combined and forms a thick batter. Spread the batter into the foil-lined pan. Bake the brownies until they are set and no longer jiggly in the center, about 25-28 minutes. While the brownies bake, prepare the frosting. In a saucepan over medium low heat, melt the butter together with the cocoa powder and salt until smooth. Whisk in 2 tablespoons of cream and the vanilla. Add the powdered sugar and whisk until combined. Add the additional 1 tablespoon cream as needed until a pourable frosting is achieved. Remove the brownies from the oven. Gently pour the frosting over the brownies and gingerly spread the frosting with an off-set spatula. Allow the brownies to cool and the frosting to begin to set, at least 15 minutes, before removing the foil from the pan and slicing. Recipe adapted from Fabulessly Frugal. *Dab your grated zucchini with paper towels to soak up some of the moisture before adding it to your brownie batter.